What hardware does the surveillance market really prefer? With a variety of options available, from name-brand commercial off the shelf hardware, to whitebox, generic solutions, and purpose-built boxes and NVRs, we sought the answer to this question in our recent integrator survey. More than 80 integrators answered, explaining their preferences. In this report, we share our findings and look at the trends we see coming out of them. Of over 80 responses, the majority of integrators surveyed are installing VMS software on commercial off the shelf hardware from name brands such as Dell and HP, though not as overwhelming as one may expect. The second option, "DVR/NVR Appliances" is used to refer to both surveillance-specific offerings such as Intransa and Pivot3, as well as boxed NVRs, such as those offered by NUUO, Panasonic, or others. Two thirds of integrators prefer to use COTS hardware, instead of purpose-built boxes such as manufacturer supplied NVRs, Intransa or Pivot3. Of those using COTS hardware, the vast majority prefer to use name brand products, as opposed to generic equipment or building it themselves. Integrators who typically deploy lower camera counts preferred appliances more often than integrators working in mid to high camera count ranges. 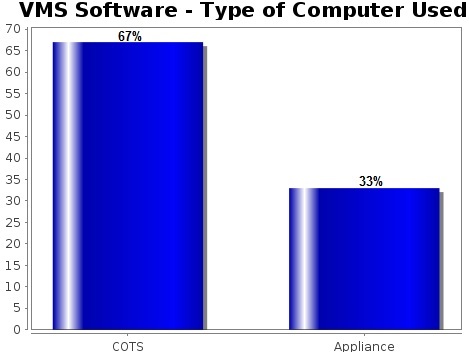 Those using COTS hardware are more likely to use Dell than HP. Integrators outside of the US are more likely to build their own servers than US integrators. Integrators preferred COTS hardware to purpose-built two to one. The number one reason cited was support. Many integrators do not have staff with the skills to build and support their own hardware. Others prefer name brands because their on-site support removes the responsibility of hardware troubleshooting from their own techs. "We have been a Dell partner for 15 years. We always get great support and the products are excellent. We experimented with build yourself boxes but the cost to support those boxes far exceeded the Dell support options." "Most of our systems are required to work 24 h /365 days. whiteboxes will cost us more time and money to maintain them." "Would prefer Dell because of 3 year guarantee period"
"Name brand products offer better warranty for service and part replacement. They can offer 24/7 support and part replacement. Whitebox can be difficult, you have to stock parts yourself." "better support, easier to have parts replaced, and no build time"
"You can't beat the on-site, 4-hour response service contracts available with the major brands. It has virtually eliminated service calls from customers related to PC or Server issues." "Because I'm essentially outsourcing the support. I can buy same day onsite server support from Dell. I'd rather send them than my own guys if it helps me cover more ground." There are some respondents who preferred purpose-built boxes, as well, and others who used both COTS servers and purpose-built boxes. Most commonly, they cited performance enhancements, with the fact that VMS softwares have been tested with the hardware being a factor, as well. "We started out using COTS products, but we have found that there are features built into products such as Pivot3 and Intransa that can provide more benefit over COTS products. Also, the performance has been better and the VMS manufacturers have tested with their hardware platforms." "I am not against appliances, we use NUUO for an economical IP based appliance. Otherwise commercial off the shelf hardware for our Milestone Systems deployments, or NVR specific hardware like PIVOT3 for enterprise rollouts." "Depends on the customer, but we prefer to use Pivot3 or Intransa hardware. Some customers insist on Dell or HP, so we don't always win." "It's actually a mixture of both. Many of our municipal customers have accounts with Dell or IBM and can purchase their own hardware direct, leaving more budget for cameras. If we are providing the units, it is either Pivot3 or Dell." "We used Intransa at two sites and it has been nothing short of a nightmare. Failed drives, failed power supplies and constant problems have arisen." "We can build more into the unit"
"1.) More ability to custom build to our design/build parameters 2.) Like to do business with a small vendor with whom we have a good relationship 3.) Cost"
"If we buy a Dell computer they want to service it themselves. They have great service but when their technician arrives and fixes the hardware problem, we still have to send someone out to get the VMS up and running. With our own server, we fix the hardware and software all at the same time. Quicker, less expensive, happier customer." "Easier to control cost compared to what the customer needs." "Cost... and again, flexibility (run into far too many "closed" name-brand PCs)." Trends emerged based on the average size of deployment of integrators. 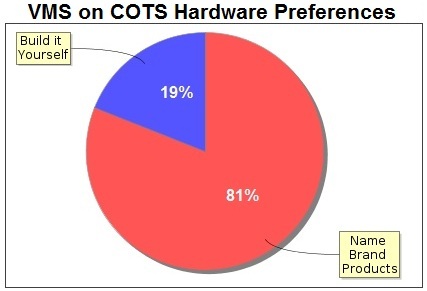 Integrators who predominantly installed 16-camera and smaller systems were still more likely to prefer COTS hardware, though the margin narrows, nearly to a 50/50 split. For integrators installing an average of 16 cameras and under, 54% preferred COTS servers, while 46% preferred appliances. On the flipside, the vast majority of integrators (72% vs. 28%) deploying larger camera counts prefer COTS server, nearly a 3:1 ratio. This is not surprising to us. Most often, small deployments have simpler requirements and integrators want to get in and out them as fast as possible. Choosing a pre-built box instead of having to install software is one way to reduce installation time. Manufacturers of prepackaged NVRs, as well as cameras, often add autodiscovery features to their NVRs, which may help to speed installation even further. On the other hand, integrators doing business in higher camera count markets normally prefer to customize hardware more precisely for the application. Buying a prepackaged NVR which may support up to 64 cameras, for example, can be a waste of money when only 30 cameras are required. Integrators doing a lot of installations typically also develop standard ordering and installation practices, to speed software installation. This makes prepackaged or specialized hardware less attractive. While we did not specifically ask which brand those choosing name brand servers preferred, more integrators mentioned Dell than HP, with few other manufacturers cited at all. Dell received 15 mentions, with HP receiving about half as many, with seven. IBM received one mention. No reasons for using any of the name brands over the others were given. Generally speaking, however, they both have approximately similar pricing and product lines, as well as support options. We believe that it likely has to do with Dell's emergence as a dominant force in the last decade. Dell had stronger marketing to both businesses and consumers, leaving them with a bit of an advantage over HP. The one trend which was most noticeably different between US and international users was on the question of brand name versus whitebox. In the US, 85% of users preferred brand name, while only 15% preferred the generic route. Internationally, however, the percentage of users preferring whitebox solutions nearly doubled, at 28%, versus 72%. While still not close to a majority, this is a non-trivial difference. Some of this swing may be due to the reduced price of parts elsewhere in the world, especially Asia. US integrators also typically prefer to save dollars on labor, instead of parts, and are more likely to view slight savings on parts being offset by an increase in time spent.